The template for this recipe is simple, and need not contain what’s in the ingredient list. You can include whatever you’ve got on hand or what’s available in season or at the market. Don’t be daunted by the number of spices. If you’ve got a well-stocked pantry or if you’re experienced with Indian food, chances are you’re already ahead of the game by that much. Combine yogurt, buttermilk, mint chutney and a pinch of salt in a large bowl. Stir thoroughly and chill. Raita can be made up one day in advance. Heat the ghee in a large skillet over medium-low heat. Add the mustard seeds. When the seeds “pop”, add the onion and garlic. Fry until they turn golden brown, stirring frequently. Add the tomatoes and continue frying until you have a reddish paste, about 5 minutes. The consistency should be somewhere between a chunky tomato sauce and canned tomato paste. Add the coriander, turmeric, cumin, chiles, cardamom pods and salt. Continue frying until the spices are all well-blended in the paste, about 2 minutes. Add the squash and cauliflower to the pan. Fry on high heat, taking care to stir frequently to prevent the vegetables from sticking to the bottom of the skillet. If the mixture seems too dry, add a few tablespoons of water from time to time. Continue cooking until the cauliflower becomes partially softened, about 8 minutes. Add pea pods to the pan. Stir. Lower heat to medium-low and cover. Cook until cauliflower is tender, about 5 additional minutes. Remove pan from heat. Taste for salt (if necessary), stir in chopped cilantro and lime juice, then serve at once. *Clarified butter. Can be store-bought or made at home (I’ll do a demo on making homemade ghee in a future post). Ghee is available at Indian food shops or gourmet specialty-stores. Time: 30 minutes, not including prep. Grind all ingredients in a food processor or blender until desired consistency is reached. Can be chunky or more liquid, depending on personal preference. This is my submission for Two For Tuesdays #6 hosted by Beth of Bethstedman. 06 Jul	This entry was published on July 6, 2010 at 12:48 am. It’s filed under food, general, Indian food, summer, vegetarian and tagged cauliflower, chutney, dinner, mint, peas, raita, seasonal and local, summer squash, tomatoes, vegetarian. Bookmark the permalink. Follow any comments here with the RSS feed for this post. This sounds AMAZING! 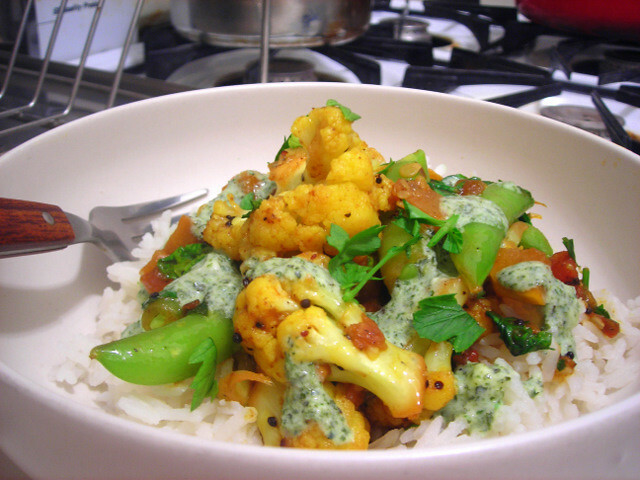 Cauliflower is one of my favorite things to use in a curry…and I love the cooling mint element in your dish. Delicious =) Thanks so much for sharing it with Two for Tuesdays! The neat thing about this recipe is that you can vary the ingredients depending on what you’ve got on hand. I like to keep the spices to a minimum so I don’t lose out on the taste of the vegetables. I’m eager to try this later in the year when cabbage arrives at the market.